I love Holly Black, she’s one of my favorite writers, so I was very excited to read this book. I loved the fact that it was standalone fantasy plus the cover is so pretty! 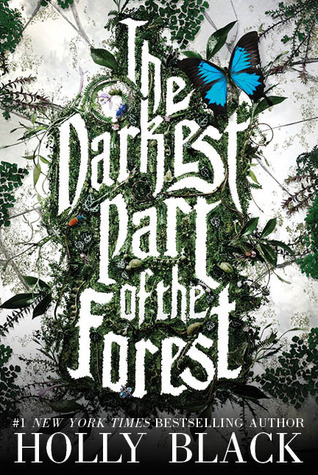 I had seen some mixed reviews on The Darkest Part of the Forest so I didn’t have extremely high expectations. I ended up liking this book exactly how I thought I would. The writing of this book is insane. There is hardly any books that I’ve read that can compare to the writing style of Holly Black. She has such a way with words and it’s so magical. I highly recommend checking out any of her books because she’s so talented. The characters are so complex and well written and the story was so unique and flawless. I would compare The Darkest Part of the Forest to Between the Devil and the Deep Blue Sea by April Genevieve Tucholke, which is one if my favorite books of all time. I just loved the story and plot so much. The one thing that I think could have been better was the world building. It kills me to say it but there was very little world building and I still don’t fully understand the world. At first I thought it was completely fantasy but things like iPods and Chapstick caught me off guard. I really wish there was better world building because I’m sure that the world that Holly created was beautiful. Overall, I loved this book and would highly recommend it. The writing was out of this world and the characters were so beautiful. Ben is definitely a character that is going to stick with me for a long time. I would reread this book in a heartbeat and it’s jump right to the top of my 2015 favorites. I love your review! I have had this book on my shelf since it came out, but I read so many mixed reviews it kinda of turned me off of the book, but I def think Im going to pick it up next! I’m so excited for this. I bought it on a whim and I’ve since seen so many great reviews for it. I just MUST pick this up ASAP. Thanks for the great review. Thanks for sharing this great review. Definitely adding to my Goodreads shelf!